A bride laughs as she holds her veil back from the oncoming wind as she poses on the golf course of the beautiful Cliffs at Glassy Mountain. This bride was full of laughter and joy before her ceremony while we took her bridal portraits on the Golf corse at the Cliffs at Glassy Mountain. This was a gorgeous venue that the Cliffs have, its on a gold course at their Mountain Cabin venue. Their ceremony was outside with the mountain in the background which was just a great detail the cliffs made. This bride was so happy and over joyed with how the day was going and her venue we decided to go take pictures outside on the grounds. We walked around to find the perfect spot with lighting and background but the bride just made the pictures, walking around playing with her veil. 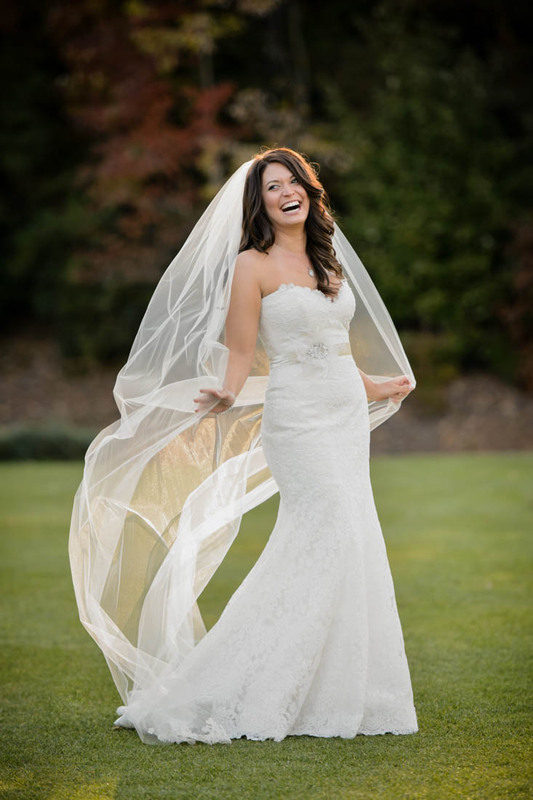 We grabbed a picture of her laughing and playing with her veil as we walked because it really showed who she is and the feel of the day.